Adrian and his son Miles climb in their backyard. See lots more tree climbing pictures in our Galleries.Tree climbing is an adventure. It starts with placing a rope high in a tree and tying a series of knots. Then you're ready to climb. But your journey is just beginning! When you get to your first branch, it's time to place your rope over a higher branch. You can go to the top or as high as you like! Climbing requires skill, patience, energy, and a certain amount of courage. But the fun and rewards of your accomplishments will be well worth your efforts. If you climbed as a child without ropes and want to try a new way to get into a tree, you may want to take one or more of our courses. TCI has several classes and programs designed for any level of climber. 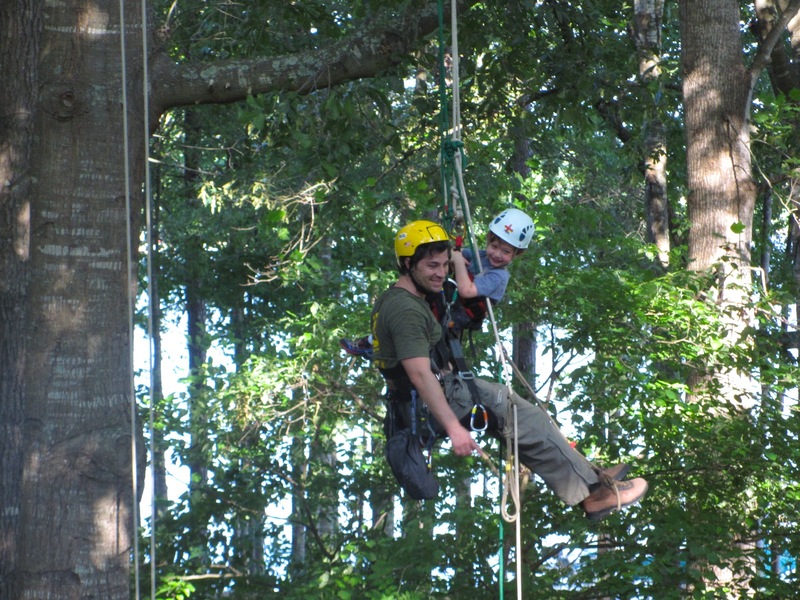 For the inexperienced person who wants to be able to climb safely on his or her own, TCI's two-day "Basic Tree Climbing Course" (BTCC) is for you. This course is available on-site in Atlanta or you can do it at home via our online course, which includes our manual and DVD. If you have taken a basic tree climbing course and want to learn advanced climbing skills, there's our two-day "Beyond the Basics" class. For people who want to become a recreational tree climbing facilitator and/or instructor, we can recommend programs to teach you the skills you'll need. Each of our courses is described in detail. Click on a link to learn more!